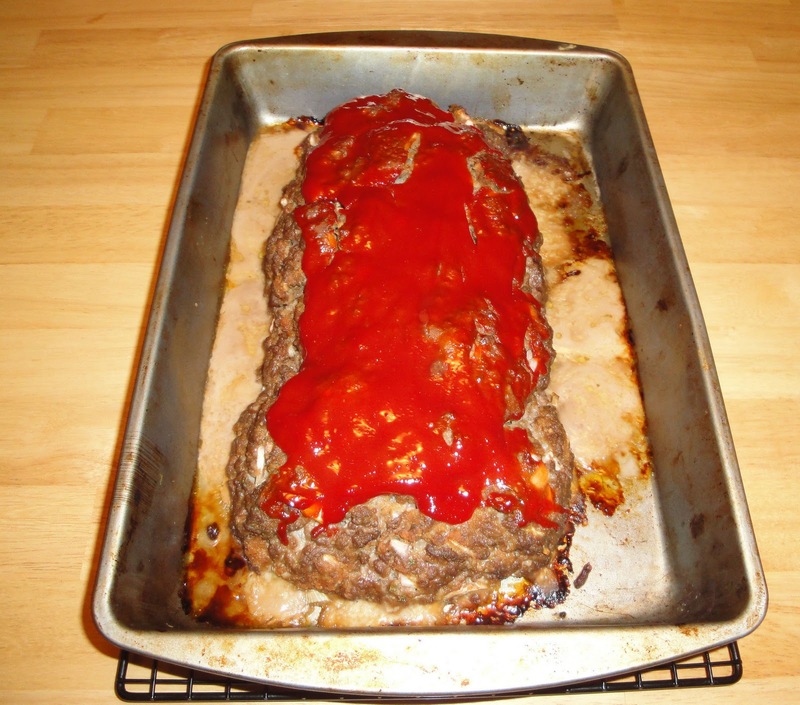 Meatloaf is a dish of ground meat formed into a loaf shape and baked or smoked. The loaf shape is formed by either cooking it in a loaf pan, or forming it by hand on a flat baking pan. It is usually made from ground beef, although lamb, pork, veal, venison, and poultry or a combination are also used. Who invented meatloaf? Good question. The meatloaf has European origins, meatloaf of minced meat was mentioned in the famous Roman cookery collection Apicius as early as the 5th century. Meatloaf is a traditional German, Belgian and Dutch dish, and it is a cousin to the Italian meatball. American meatloaf has its origins in scrapple, a mixture of ground pork and cornmeal served by German-Americans in Pennsylvania since Colonial times. However, meatloaf in the contemporary American sense did not appear in cookbooks until the late 19th century. Meatloaf is a versatile dish. I love meatloaf. I love having a meatloaf sandwich for lunch. Preheat oven to 375 degrees. Place all ingredients in bowl, mix well, using your hands. Place on 13x9 baking dish. Shape into loaf. Drizzle Worcestershire sauce over loaf, then spread ketchup on loaf. Bake for 1 hour. Enjoy! Great story:) Always nice to read about history of dishes:) Also never knew you can smoke meatlaof. Interesting info on the origins of meatloaf, great post! Nice Christine, but I have to try with lamb or chicken, we don't eat beef. Meatloaf is such a satisfying meal! It makes the best leftovers for sandwiches, doesn't it? Now that the weather is cooling off just a bit, we can use the ovens once again. Your meatloaf is so inviting. It is one of my favorite comfort foods for sure. Everybody has their own little touch to their meatloaf recipe, but in the end it is still comfort food. Looks good, Christine! I also like meatloaf on a sandwich as it reminds me of a meatball sub! Meatloaf does get a bad rap I think until we grow up, then it becomes a comfort food. It is welcome in our house-yum! Yours does look tasty and I did learn a few things from your post-thanks for sharing and have a great weekend. My husband loves meatloaf. I like it on a sandwich myself. Yours sounds great!! Meatloaf does make the best sandwich. Yum! Chicken or lamb would be good. One of my husband's favorites! Great recipe! I LOVE meatloaf sandwiches. I put mayo and salt on mine...what do you put on yours, Christine? Somewhere in my culinary travels it's seems that I've heard "scrapple" before but I didn't have a clear understanding of what it was. Thanks for clearing it up for me and sharing this recipe. My hubby loves a good meatloaf and I'll be making this for him. Wow - meatloaf goes back a long way! Interesting post. Nice easy meat loaf recipe - I always like the ketchup on top - contrasts the sweet and savory flavors. I love the historical discussion here. Looking forward to more! I like to add mayo, salt and pepper. Good stuff. I haven't made meatloaf in years! I really need to make it this fall, great recipe! Meatloaf--oh yum. I think I'll go make some right NOW! Thanks for the kind comments. I hope y'all had a great weekend. I love meatloaf and what is even better is a cold meatloaf sandwich the next day that's my favorite part always. :) Yours looks fantastic!